My tours consist primarily of house concerts. 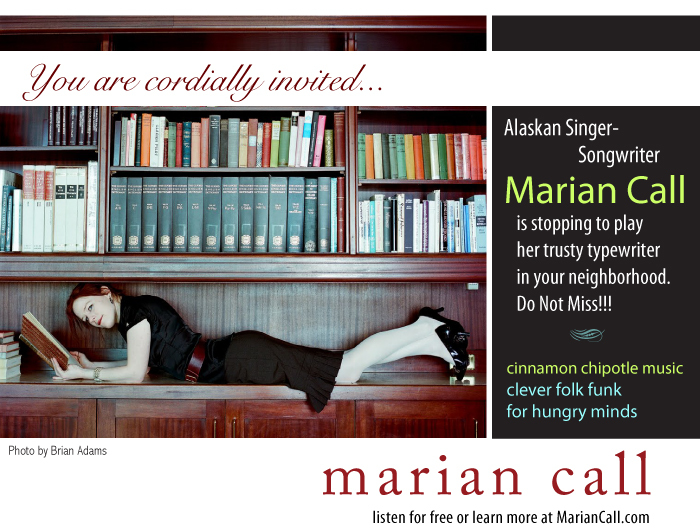 Yet most of my listeners have never attended a house concert — even fewer have hosted. Most of my shows are with first-time hosts and first-time house concert attendees. And they are GREAT! Most folks immediately want to do it again! So what’s the deal? Here’s the deal. Let’s go back in time, back to the millenia before television brought Mick Jagger at halftime into your living room through a glowy blue box. If you wanted live music, you had to make it happen in your own house, yard, pub, temple, piazza, or outhouse. The best modern equivalent is a house concert. I’m not saying those old days were better, but I am saying it’s probably been too long since you’ve listened to fantastic music up close and live in a quiet environment — that’s a transformative experience. It’s way different than going out to a bar, way different than listening to MP3’s, way different than anything the glowy blue box can bring you. And YOU make it happen. Besides, it’s easy to put together, cheaper for everyone attending, friendly, fun, all ages, environmentally smart, economically smart — and the food and drinks can be way better than what you get going out. How does it work? First you contact an artist, set a date, get confirmation and work through simple logistics. Then you invite your friends by e-mail and take RSVP’s – you plan for food or drinks (make guests bring it all if you want to) – you clean house a little – and then I show up, set up my gear, and play for you! “I’d love to, but my house is too small.” EVERY host says this at first. No, it’s not. I’ve done house concerts for 5 people in a tiny cabin in Alaska and for 25 in an even smaller crowded standing-room-only flat in Hollywood, with everyone shoulder-to-shoulder. I’ve even played a dorm room. Your house can fit way more people than you think. Pretend it’s a club in Manhattan — your living room is probably capacity 75. “I’ve never done anything like that before.” You probably have. Take any kind of house party you can think of — a drunken BYOB bash, a child-friendly family potluck, a birthday party with presents, a backyard BBQ, a fancy wine and cheese event — and just imagine that the theme of the afternoon/evening is music. The artist (me) will provide absolutely everything related to the music part of the show; all you do is put on a very normal party, invite people, set out drinks, and wait for all of us to show up. I manage every part of the evening that is not simply **hosting people in your house** and you have done that before. “I don’t know if I want strangers in my house.” No need to have any (besides me). You can host your “house concert” at a local community center, apartment common area, school, place of worship, restaurant back room, park, swimming pool — anywhere! People get very creative, using these concerts for fundraisers, community events, conventions, kids’ time, etc. The host sets the parameters. Also — in five years of house concerts, I have never had a true problem guest, someone scary or icky. Awkward, yes. Scary, no. 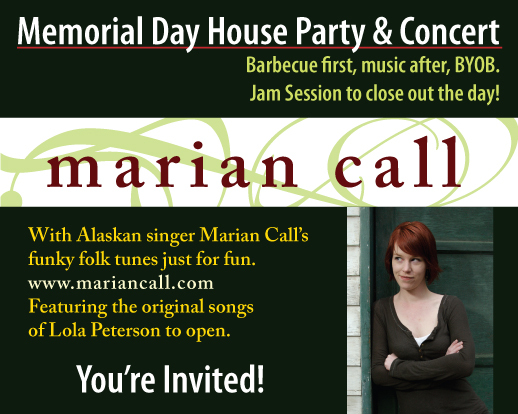 You can also have a private house concert (only your friends) if you can guarantee enough guests. “It will take so much time!” Well, it can, but it doesn’t have to. I’ve played some elaborate, carefully coordinated house concerts, and some that the hosts just allowed to happen. Potlucks are especially hands-off and take only a few e-mails to coordinate — make other folks bring food, let them clean up. It doesn’t have to be an ordeal if you keep things simple. “Wow, that was amazing and special and unforgettable. And it was so much easier than I thought!” I hear this nearly Every. Single. Time. Most hosts and guests are thrilled by their first house concert. Get out to one in your area if you want to know how they go! There are lots of normal folks like you ALREADY hosting monthly or quarterly concerts because they’ve found it’s so easy, fun, and memorable. Just google one in your area. Artists love to be asked to do house concerts — we’re ignored and underpaid on the bars-and-cafes circuit. Your favorite local musician would probably be thrilled to play in your home you. Why not ask? If I’m not in the neighborhood anytime soon, think of a local band you love and invite them! I ask again, wanna do it? 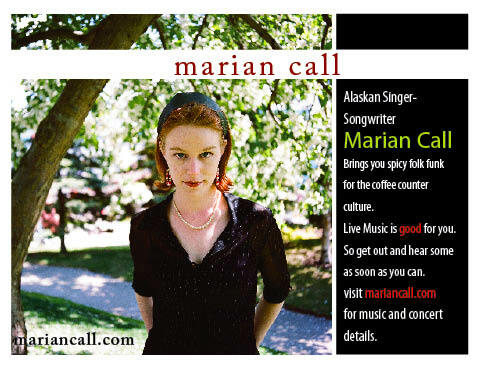 Then write to me, marian@mariancall.com, and put your city/state/province in the subject line. If I’m coming through your area soon, I’ll get in touch. If not, just wait a year or so. That might seem like forever — but I have frequently called on people two or three years later, with thanks for their patience, and then we have had such a wonderful time! If I can’t book a show with you soon, I’d like to say in large, friendly letters: DON’T PANIC. I still love you, and I will nearly always provide you with a personal invite to another nearby show. Please don’t be bitter. Sometimes I have another offer or a backstage reason for booking a café show instead. So! If I do choose your concert: DON’T PANIC. It might stress you out at moments, but trust me, when you look back you will find it was pretty easy. And it will be really fun. I’ll notify you, we’ll iron out the details and reserve the date, and I’ll equip you with what you need to set up/advertise/invite folks/manage RSVP’s and so on. We can’t play in a smoky house (tobacco, marijuana, pipe smoke, incense, anything). Sorry. No judgment, but we have to play every single night, so smoke is a no-go. And if you have friends who are likely to come over and smoke or vape (anything), they need to do it outside. If you do have a smoky house don’t despair, we can work out hosting in another location! We sometimes need a cat-free house for one of my guitarists, I’ll let you know if that’s the case. People often reassure us that the cat is never in a certain part of the house, or that they’ve cleaned really well, but to date nothing has ever been cat-free enough to avoid the allergy agony. We can work out an event at one of your friends’ houses, though, or in a community space nearby, so it can still be your party! Dogs are OK, but they need to be kept away from the actual concert room, and the space needs to be dog hair-free, both for us and for guests. Super-excitable dogs who will bark at every arriving guest should be sent to visit a friend for that day. You also need to provide at least some of the guests at the concert. Most house concerts are populated partially by the host’s friend and social circle, and besides, that makes it more fun for you! Fans who are unknown to the host will also RSVP by email, and it’s your job to inform them of the details, set them at ease (it’s likely their first house concert too), and keep track of all the attendees’ contact info. Choose what kind of food scenario you want — appetizers, cookie party, BBQ, sit-down dinner, wine and cheese, beer and brats. You can make all your guests bring it if you don’t feel like preparing anything. Whatever food is provided, my guitarist and I will need some separate healthy food set aside for us, veggies & hummus, green salad, an egg, simple whole foods — we can’t eat party food every single night, even though we wish we could. Please don’t press extra desserts on us, we are trying to survive tour! You don’t need to have enough chairs, but you do have to prepare listeners to bring their own, or else borrow or rent some (they’re super cheap). I can pay for the cost of renting chairs if necessary. We need either AT&T phone service or else wifi that is unlikely to quit on us. We don’t necessarily have to stay overnight, but we do need a room somewhere with a door that closes and a clean bathroom to prep ourselves and keep our stuff out of the melee. If you do want us to stay overnight, please read this for details on what works best with food and sleeping arrangements. Your biggest responsibility is to send out invitations, keep track of RSVP’s, and send a day-before reminder to your attendees. More details on invitations below. We need to have at least 20 confirmed adult guests for most shows, and 25-40 is better. If you plan on a small private party, a minimum guarantee is an ok substitute (the exact minimum will depend on our travel expenses, ask if you want to know). If the concert date is a week away and you don’t have 20 guests or enough interest, you need to let us know so we can promote the show harder. If we reeeeally can’t get any more guests, then we can talk with you about what we want to do. But don’t be afraid to let us know what the state of your invite list is — if we know what’s going on, we can work with it. What’s your name, phone and email address? Any important parking notes, or directions (like how to buzz into a building)? What are the nearest large metro areas to you, if it’s not obvious from the address? Are kids/minors allowed? Is your house childproof? Babyproof? Is your house accessible for folks who have trouble with stairs? What are your plans regarding food and drink at the show? What email address should we use for folks to RSVP to you? Have you read the requirements above, and does everything work for you? No cats, dogs put away, no smoke, healthy food, clean enough? • How does the event flow? …First my guitarist and I arrive, set up, and hang out. The party starts as guests arrive with about thirty minutes to an hour of mingling/food/drink as people arrive. When the moment feels right (or right on the clock, however you like it) you invite people to claim their space for the show, and I begin performing. I usually do two forty-minute sets with a break. During the show at some point, I invite people to pay us some money or buy CD’s, and on the break I help swipe cards and stuff. After the show people mingle a little longer, sometimes for hours, sometimes going home right away (up to you). When everyone’s gone usually you and I crack one last beer or heat one last cup of tea and sigh and chat about things. Then I drive away (or sleep on your couch, depending) and provided your guests are the good kind, you’re left with minimal mess. • What about the *gulp* money? Awkward… I understand completely. Asking guests for $$ is awful. If you mention it up front, in the e-mail invitation, it’s actually less awkward — aside from that, you don’t have to deal with it, I will. Good wording for your invitation is to say “there’s a $10-20 per person recommended donation for the artist, pay-as-you-can.” Then people know what to expect in advance. I’ll reinforce that with a friendly announcement during the show. We leave a basket of money with the merch so folks can make their own change, and I accept cards and so on through my phone, so you can ignore the money at the concert. • What if a guest is worried they can’t pay the cover charge? My “recommended artist donation, pay-as-you-can” is exactly that, and someone can only pay $0, I still want them to come to the show, no question. So if a guest is concerned about cost, make sure to communicate that **they are more important to us than their dollars. ** If they feel bad because they can’t pay, let them know they can volunteer to help instead; often that makes it easier for them to attend. • Are you sure you won’t play outside? We have the prettiest backyard! …I love you, but no. No more outdoor shows. After the last tour I am done with them for good. I can share stories about this decision if you need to hear them, but just trust me. If you want to have a backup outdoors space in case of a Glorious Weather Occurrence, that is acceptable, but the primary concert space needs to be indoors. • How do I best promote the event? To get the word out, e-mail invites and a Facebook event usually do the trick; some folks use a service like evite, but I’ve never seen that go well. BUT the very best promotion in the world is word of mouth. If you’re excited, if you talk about it a lot, your friends will be too. If not enough people are coming, communicate to them your excitement and how important this is to you. • Should I put up posters or fliers or call the paper? Nah! That never works. Don’t waste your time. A possible exception: a community you’re very close to, like a place of worship, workplace, or community center where people know you and are invested in you. • Do I have to post my personal information on the internet? You **never** need to post your address or phone number publicly, even on your own private Facebook. I recommend strongly against it! (Is your home address already on your Facebook profile, by the way? Bad idea, remove it.) Keep all your personal info in emails or DM’s, especially your address. And if you email your whole guest list, please BCC everyone for their privacy. 3 weeks: create and send email invitations, tweet or FB about it, and begin your guest list. Keep an eye on your spam filter, it catches RSVP’s from strangers! Respond to strangers’ e-mails promptly with the address and details, so they can decide whether to come. 2 – 3 days: send confirmation email to people who did RSVP. Repeat any necessary directions, parking details, date, time. And let folks know that if they cancel, they should call/write you, in case someone is waiting to get in. This confirmation email is the most important step! People forget about the show they RSVP-ed for with shocking regularity! 1 day: if you have cancellations and folks on the waiting list, help them to get squared away. Keep an eye on your email and junk folder as many people wait until the last minute to RSVP. I try to check in with you periodically as the show gets closer, to make sure you have what you need. As we get within a week of the show, you can feel free to text me if you need quick answers about something. To make a stellar invite: Materials are here and here, including a bio, descriptions of the music, and photos you can use (with a photo credit). I recommend sharing links to your personal favorite streaming song or video online. Photos are very effective, though linking to them is better than attaching them. A few personal words from you at the top of the invitation will help more than anything; this isn’t just a generalized campaign, it’s something you’re personally doing — maybe say a word or two about why. People care more about that than any flashy graphics! I have a prefab invite or two below to give you an idea of what some folks have done in the past. They’re easy to design! You can certainly make your own using the photos here. Or just steal one of the images below and edit edit edit. Things it’s important to clarify when you invite people: 1) this will be a house concert, not a house party, and the music is for listening to; 2) bring your own _____ (chair, food, beer, whatever they should bring); 3) whether kids are welcome, and if they are, what age/whether childcare will be provided; 4) it’s free, but a $10-20 donation per person is recommended. It’s best if people know that coming in. • Can I really do this? …Absolutely! And to paraphrase most of my house concert hosts from around the country, it’s a fantastic and memorable and [insert many glowing adjectives here] experience. You’ll be so glad you did. So will I. I’m proud of you! *Re. Clean Houses: I have played at two or three truly awfully dirty houses, but that is out of hundreds of sufficiently clean ones. I don’t intend to do play or stay in a filthy house again, even though I love the people I met there — just a question of staying healthy on the road. Here’s a simple test for cleanliness: when company comes over, is any surface in your house sticky when it’s dry? Is there any rotten food sitting out in the open? Are there scraps of food in any area outside the kitchen? Are there resident insects — not just intruders, but resident colonies? If the answer is no, then your house is clean enough for a house concert. Almost every house is. At least by the time we see it. You might have some clutter, but clutter is not a problem, clutter is just life. If your house does not pass the cleanliness test in the preceding paragraph (when company is coming over), we love you and we do not judge you, but we would like to visit a different house please.